Creams, ivories, cognac browns, and whites, all come together to create the prettiest winter outfits. Second to a great all black outfit for me is an outfit filled with light neutrals. It has a chic and sophisticated feel to it, very put together and elegant. It’s easy to create by mixing your favorite light colors. 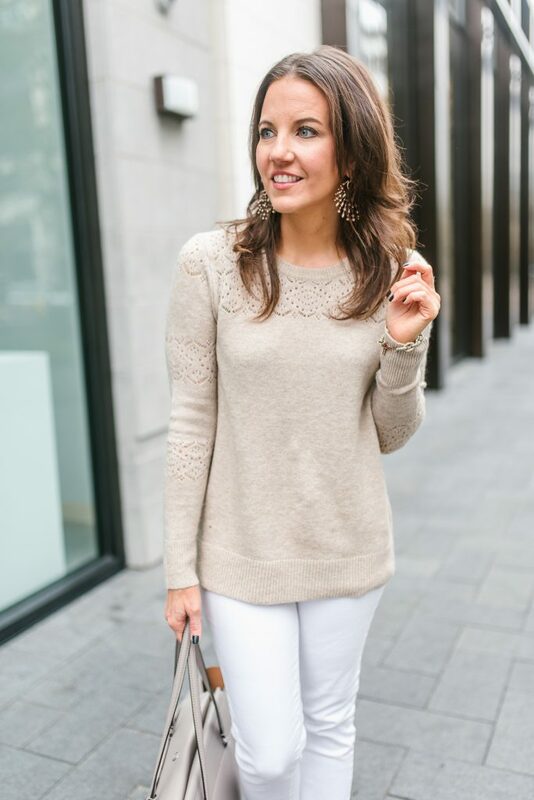 I picked up this lacy beige sweater over Black Friday. 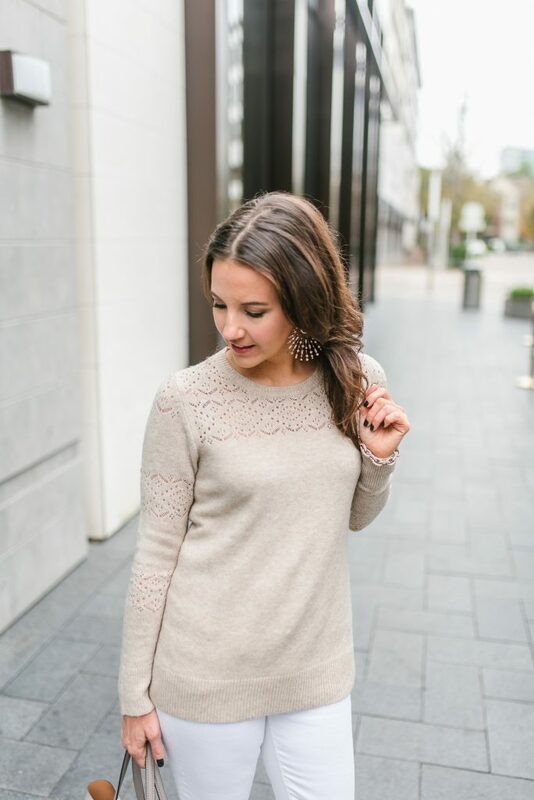 The lace like details are so gorgeous and add a beautiful feminine look to the sweater. It’s a lightweight sweater, but it still has warmth to it. 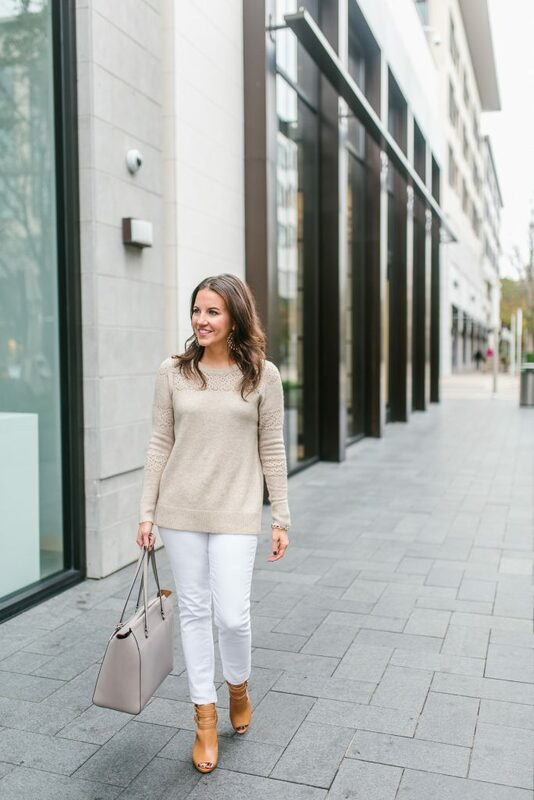 This sweater comes in a few other colors, but I love a good neutral sweater. You can also pair this with black jeans and brown boots for a different look. Also, can we talk about these rose gold earrings! Rose gold jewelry is one of my current obsessions. It’s such a beautiful color and mixes well with different outfits. 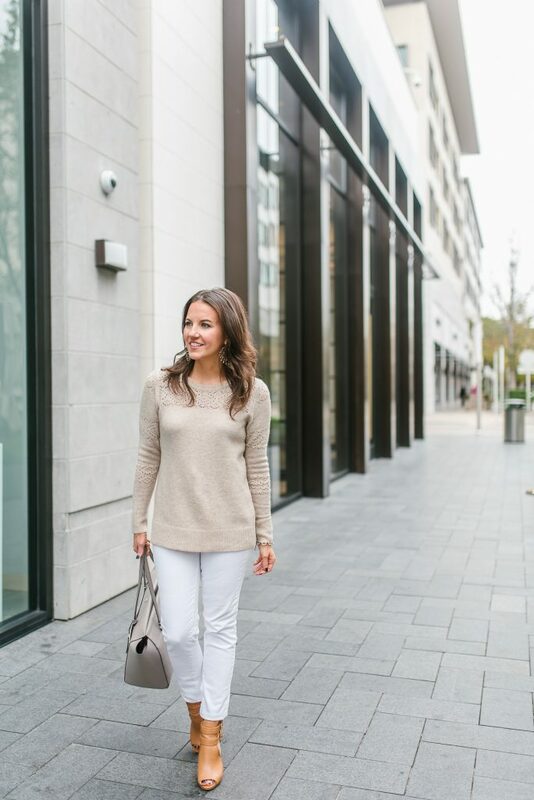 The color compliments this light neutral outfit perfectly. These rose gold statement earrings are stunners and easily dress up a casual outfit. These earrings will be on major rotation this holiday season! We are officially one week from Christmas Eve, and in the final week of all the holiday parties. It’s also time for my best of series. Later this week, I will be sharing my best of Beauty Products of 2018, and I’m finally going to share some of my favorite runway looks from New York Fashion Week. I figured we could all use a break from all things Christmas and Holiday related. So stay tuned for all of that fun hitting the blog this week! Happy Friday!! Ya’ll I’m obsessed with this outfit! For starters, the sweater, skirt, and boots combo is one of my favorites this time of year. I have shared similar combos a few times already on the blog HERE and HERE, and I don’t see me slowing down on this one anytime soon! 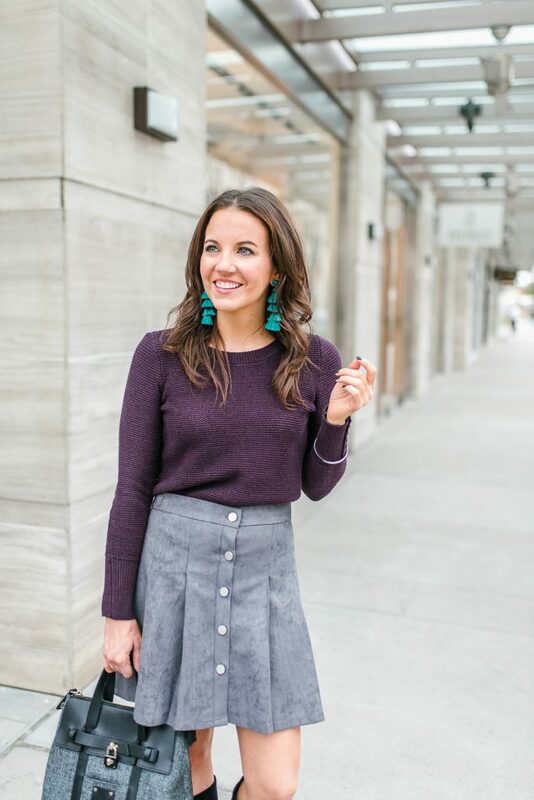 I’m quite in love with this gray button front suede skirt. The color is gorgeous and the pleated fit and flare design is so fun. I also LOVE this color combo. 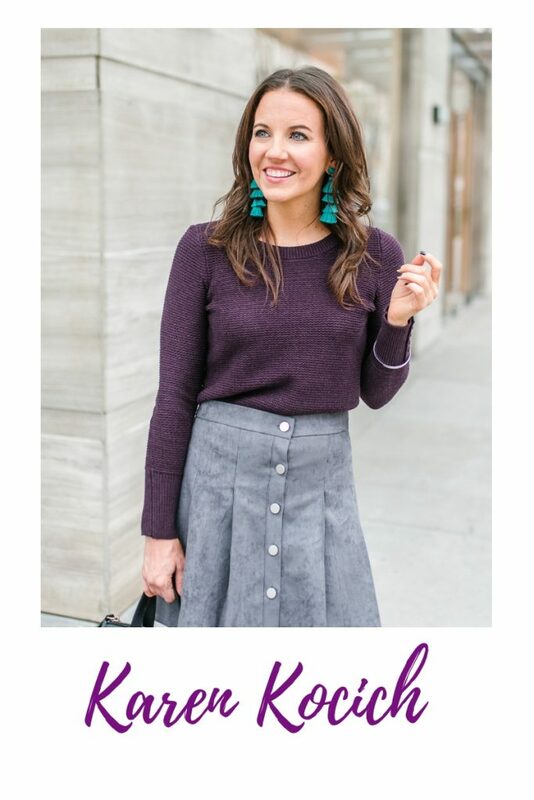 Dark purple and gray are so pretty together, and the pop of dark teal just compliments the whole look. 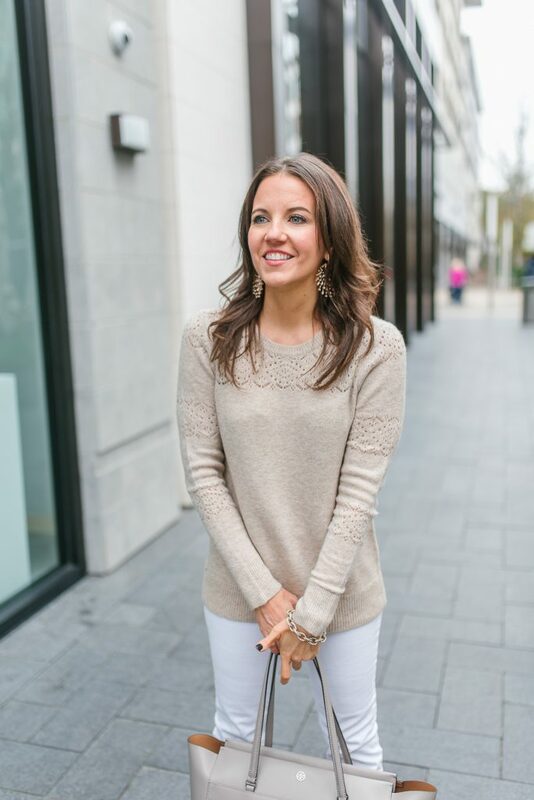 This lightweight sweater is designed like a thermal knit top. It’s super comfy and comes in a bunch of different colors. I could not resist this dark purple shade. It’s perfect for tucking into skirts, but also looks cute in a more casual jeans look. It’s also 50% off until noon today with free shipping. Can you believe we are just a few short weeks away from Christmas and a New Year? I wrapped up all my holiday shopping this week, and it feels so good to have it all done. Now all that is left is wrapping gifts. By the way, I shared a cute way I wrap my Christmas gifts earlier this week. You can check it out HERE if you need a new idea. I have a couple holiday parties this weekend including a big family party that I look forward to every year. I hope you all have a fabulous weekend and thanks for stopping by! Hello Ya’ll! I can’t believe how close we are to Christmas! I’m sharing my final gift guide of the holiday shopping season, and it feels like I was just sharing my first one. Many of my holiday parties are gift exchanges with a $20-$25 limit, so I wanted to share a few ideas in case any of you are needing some ideas in the lower price range. When shopping for gifts under $25, I like to head to Target or Nordstrom Rack. Target has all the cute things, and Nordstrom Rack carries many of the same brands as the normal Nordstrom for a fraction of the cost. Both are great options to find everything from jewelry, beauty, and home. 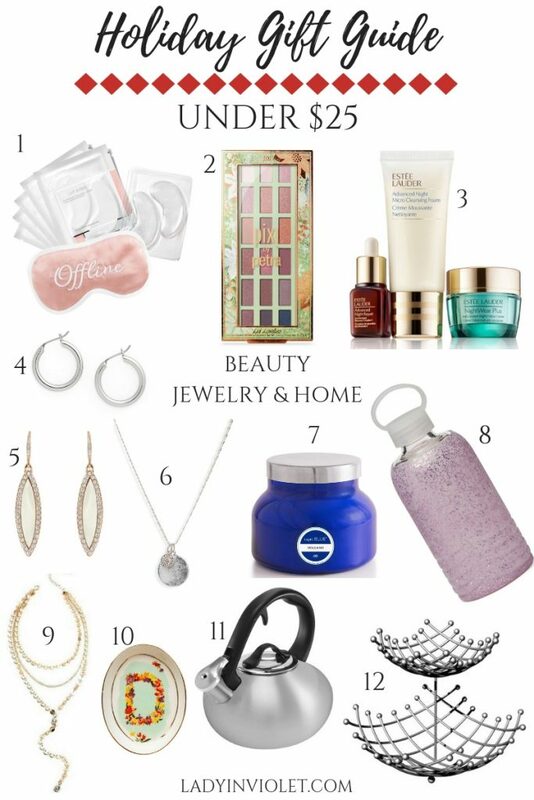 I also included a few items from Nordstrom, because I found a few cute under $25 gift ideas there too. During the holidays, brands will put out gift sets closer to the $25 range. If you plan to order online, I would highly recommend ordering today. I know some places give you a few more days, but I like to be safe and order a few days before that deadline. I will be wrapping up my final online gift order today, so I’m not stressing about my packages arriving on time. Also, if you need a cute gift wrapping idea, I shared a simple gift wrapping tutorial yesterday. You can check it out HERE. Alright ya’ll, good luck with all your holiday shopping and thanks for using me this season for a gift ideas resource! I’m definitely one of those people who loves giving others gifts. I like trying to find the perfect gift and the excitement of watching them open it. Part of the fun of gift giving for me is also wrapping the gifts. I think it makes the gift feel more special and it’s bonus Christmas decor under my tree all month long. 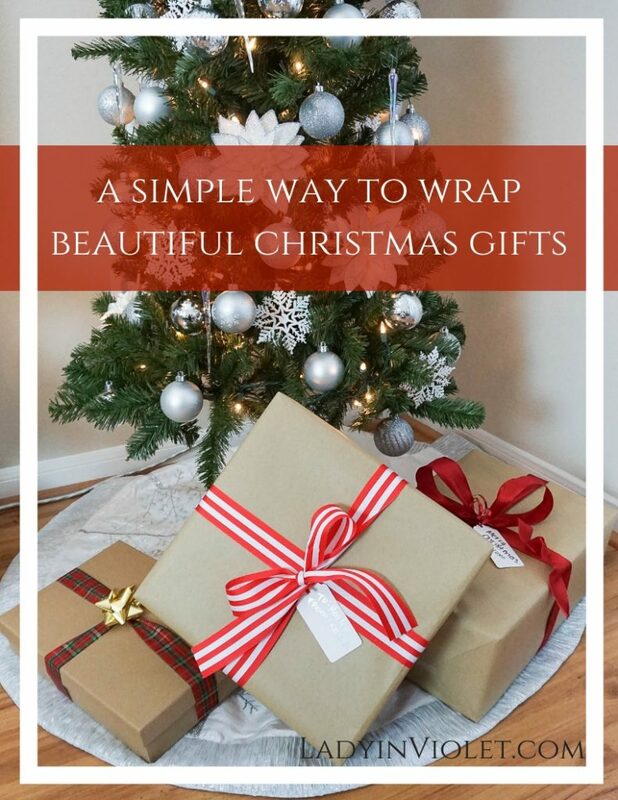 I wanted to share one of my simple ways to wrap beautiful Christmas gifts with you. It’s so easy and I included pics of the whole process! Instead of buying tons of different paper for every gift giving season, I buy brown paper and white paper and use colorful ribbon instead. It’s easy to wrap and looks gorgeous! I buy all my Christmas ribbon after Christmas when it’s on sale. STEP 1: I start by wrapping my gifts in the brown paper. Measure out and cut the amount of paper you will need and tape all sides. STEP 2: Measure out your ribbon. You want to start by pulling more than you need out because you will need this to go around the whole box, plus tie the bow. You can always roll some back in if you pull too much. STEP 3: Lay the box over the ribbon with top of the gift facing the floor. Then take your ribbon and lay it side by side across the box. STEP 4: Twist the two strands of ribbon together at the middle of the box and cross to the other side of the box. STEP 5: Pull snug on the ribbon so it will not loosen and will stay laying flat against the box. Then turn the box over. STEP 6: Bring the two pieces together and tie a loose bow. If you have too much excess ribbon, you can turn the box back over and roll a little back up buy loosening the twist in the back. STEP 7: Measure the two loose ends and cut the ribbon off from the roll. STEP 8: Re-tie your bow creating a tighter bow that will hold. Fluff the circle portions of your bow to help give them shape. STEP 9: I use simple white gift tags to write the to/from on. Then use a skinny ribbon to tie this to the ribbon just under the bow. That’s it. Super simple and easy once you get the hang of the process. When picking ribbon, I usually prefer to go with non-wired ribbon for a flat bow and wired ribbon for bows with more shape. The gift wrapped in solid red ribbon is using wired ribbon, so you can see the difference. If bow tying is not your thing, you can also just add a bow on top the ribbon too like below. It still creates a beautiful gift, just double knot the ribbon and cut it off. Then attach the bow. Let me know if you have any questions about the process or if any steps seem confusing. If you want more info on my holiday decor, you can check out my HOLIDAY HOME TOUR!